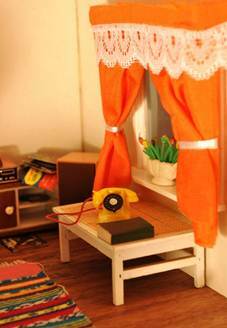 Note: real phones and children’s toy phones are illustrated, as they can help date dollhouse phones. 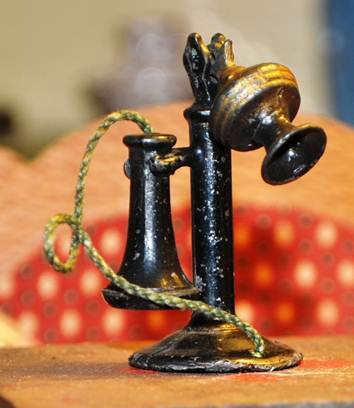 Alexander Graham Bell patented the telephone in 1876 in the United States and, by 1880, there were over 60,000 telephones in the US – all of which needed the services on an operator. 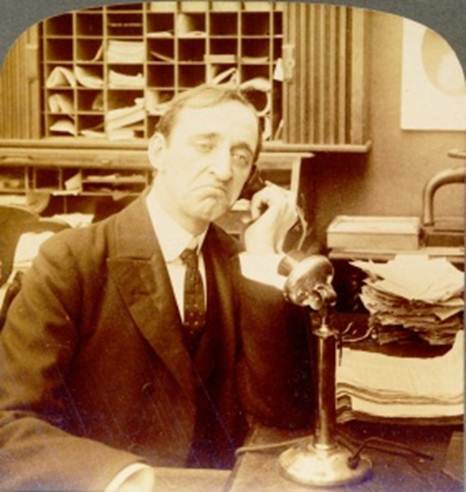 Even though Bell made a call between Brantford and Paris, Ontario, Canada, in 1876, it was not until 1915 that there was a practical system of long distance calling. 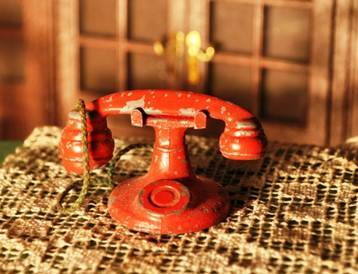 By 1904, there were three million phones in the US connected manually with a switchboard. 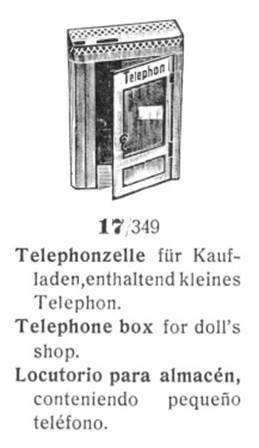 Dollhouse wall phone made of wood with metal attachments, 4½ inches high, shown in early 20th century catalogues of the German firm, Erhard & Söhne, which also produced a phone with double bells. 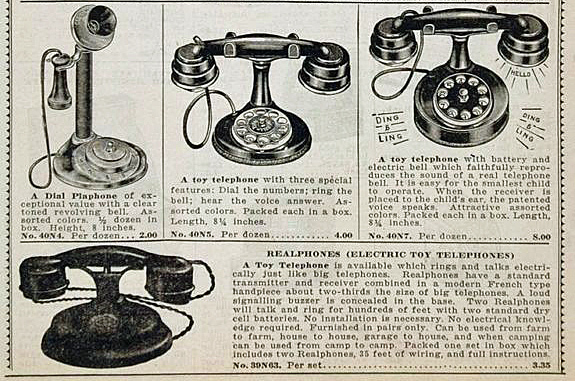 Although these toys are often characterized as large scale, the actual phones – as can be seen in the 1891 stereocard above – were indeed large. 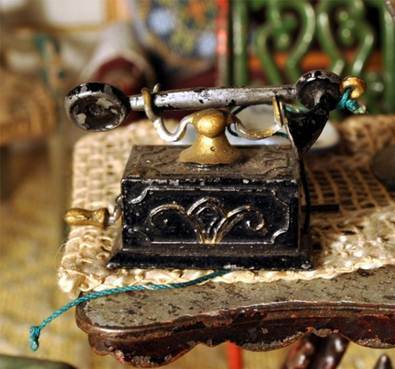 Such a phone might have been found in homes from 1882 to about 1920 in areas with access to operators. N.B. 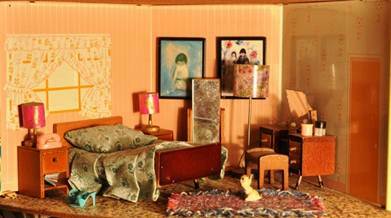 For readers interested in the Erhard & Söhne firm, see Swantje Köhler, Ormolu Dollhouse Accessories (2007). 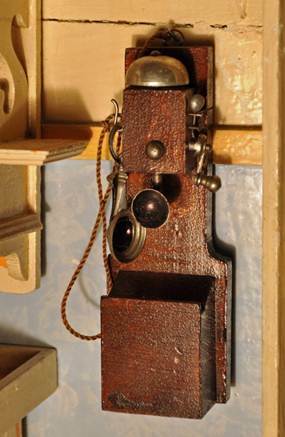 The body of this metal wall phone from the 1880s-‘90s is 3 inches long. 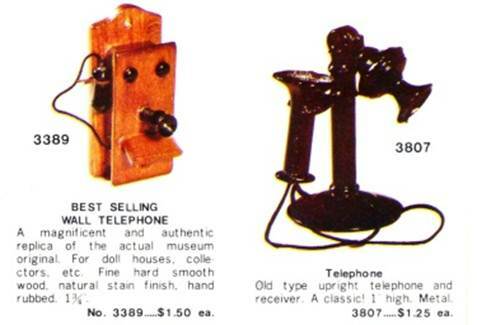 The first phone had a single transmitter-receiver, which the user had to keep switching from speaking into and then listening, etc. 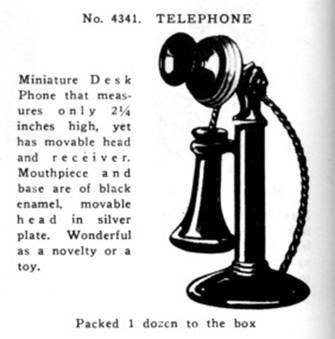 In 1878, a model was introduced with two transmitter-receivers so that one could be held near the mouth and one at the ear. 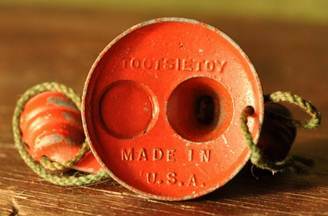 This seems to be a transitional one, as there is also a mouthpiece (replaced on the example on the left). 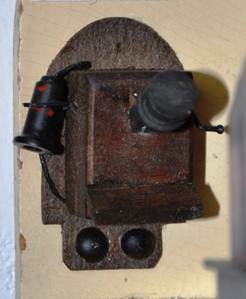 The crank on the side was used to alert the operator or, in this case, to ring the bell and amuse the child user. 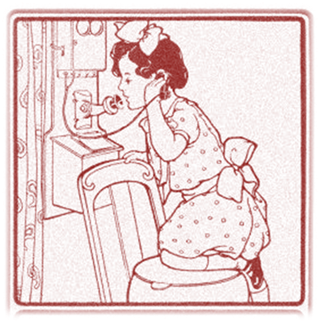 The advertisement is from 1905 in the Wiemann & Muench, Milwaukee, Wisconsin, catalogue. 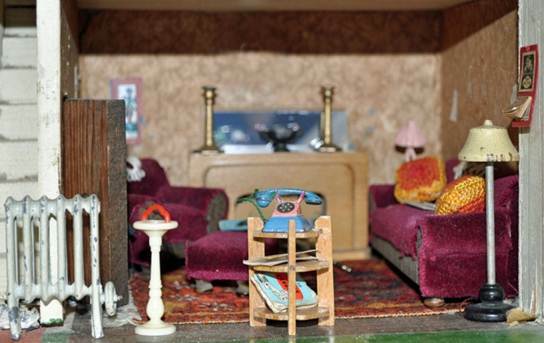 Also an “I want to phone my Baby” model, it has discarded the pair of transmitter-receivers. 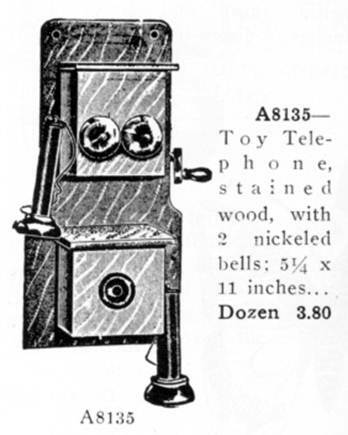 Wall phone in a large scale as a child’s toy in the 1905 John Wanamaker catalogue, US. 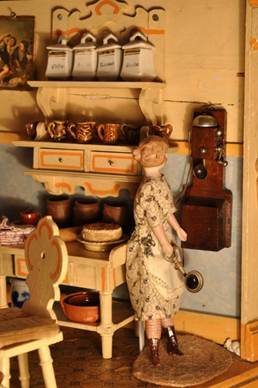 Wooden dollhouse wall phone representing an early type but the date of manufacture uncertain. 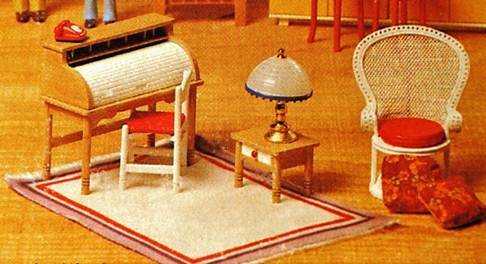 1924-6 Universal Spielwaren Katalog, Germany – probably large enough for a child’s toy. 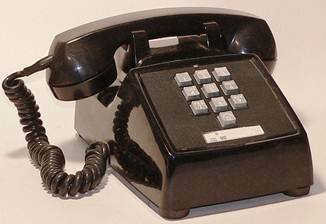 This style of phone is becoming obsolete, as rotary dials are now in use. 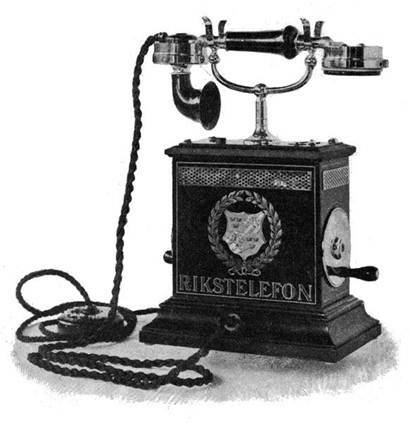 Table phones: above, a real phone of 1896 made in Sweden. 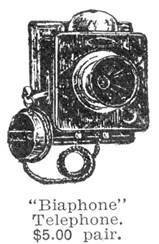 One of the innovations of this type was a convenient, combined transmitter-receiver in one handle. 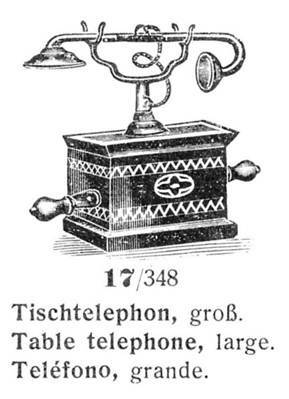 A child’s toy phone in 1924-6 Universal Spielwaren Katalog, by which time this model was becoming obsolete. 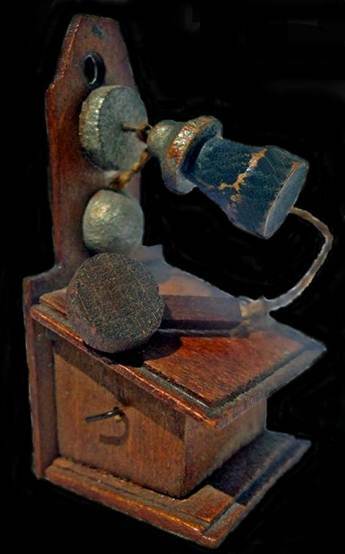 1906 stereocard showing a desk stand, sometimes called a “candlestick” phone, in use since 1897 and remaining popular until about 1930. 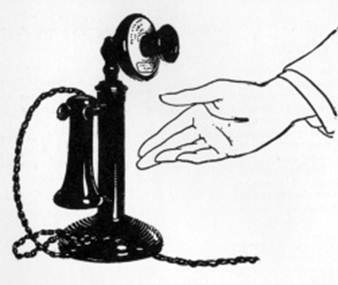 About 1920, a dial was added liberating the phone from its dependance on operators. 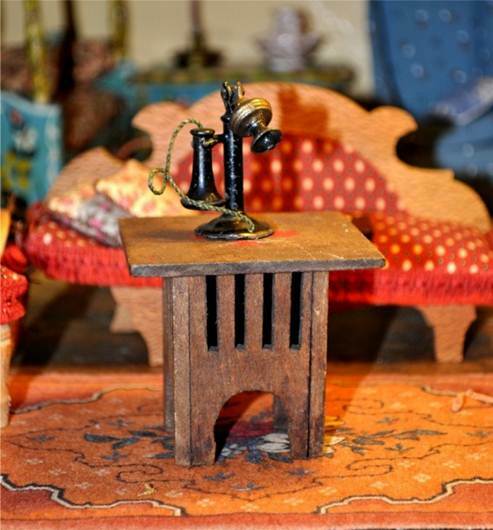 Dollhouse desk stand phones with dials, which became practical to use for the general population about 1919; the old system of asking the operator by the name of the person to whom you wished to speak was replaced by telephone numbers. 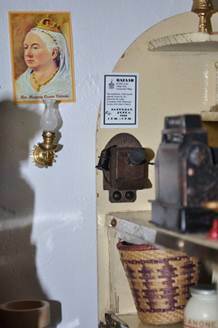 In Europe, the numbers on the dial were not accompanied by letters of the alphabet, as they were in North America. 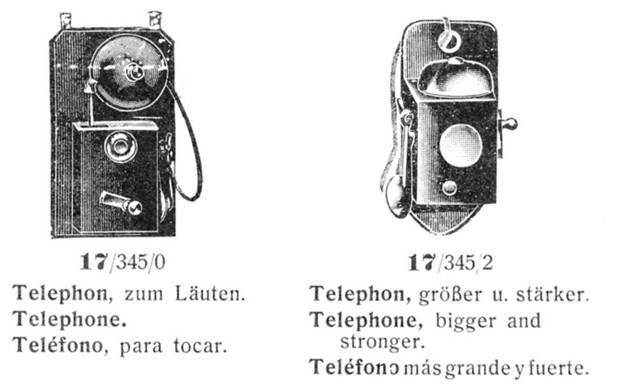 One contemporary advertisement described the new way as “unmeasured, unlimited, and secret service.” The above phone is well manufactured and marked “Made in Germany” and measures just under 2 inches high. The one below is more crudely cast. 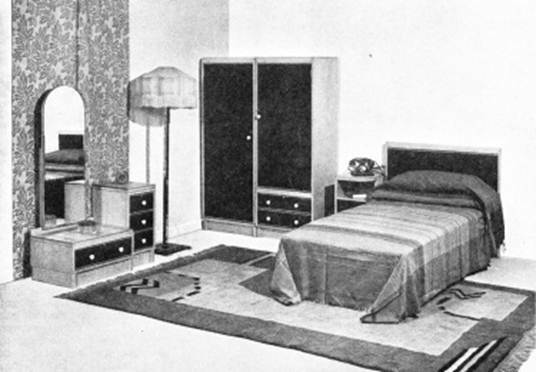 1937 Dial phone in a real bedroom, Homes and Gardens (London). 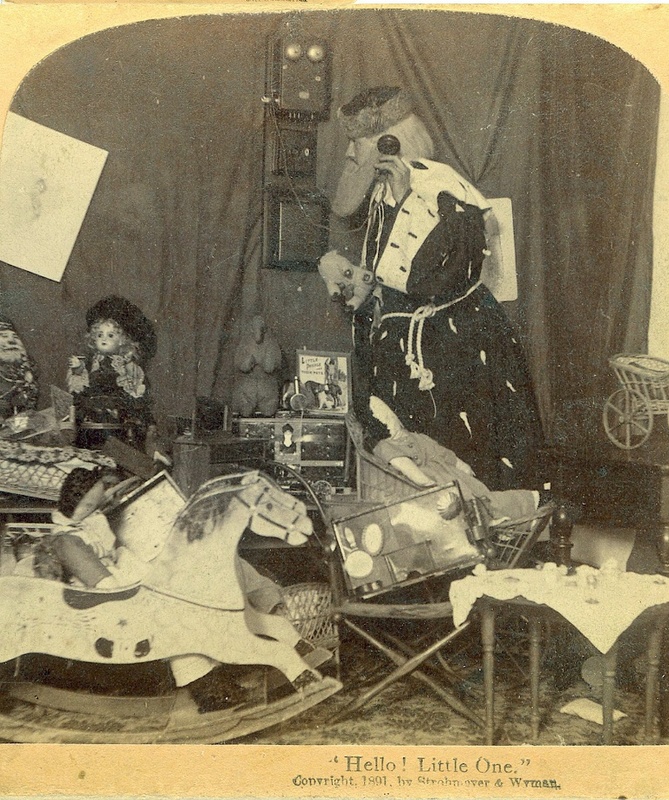 Toy maker F.W. 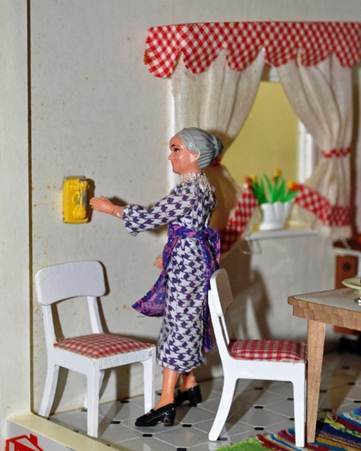 Gerlach of Naumberg was making miniatures of this type in the late 1930s. 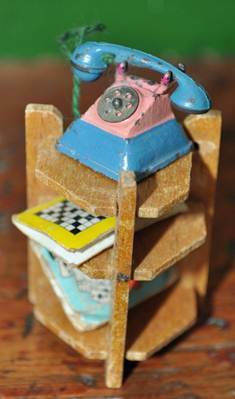 Dollhouse phone painted pink and blue with a rotating metal dial, base five-eights of an inch square, 1930s. 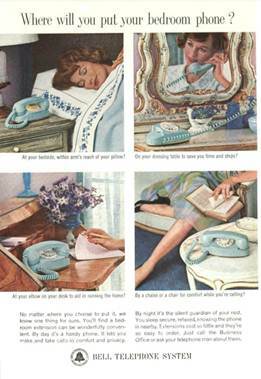 right Colour phones become widespread after 1954, as seen in this 1954 Ladies Home Journal. 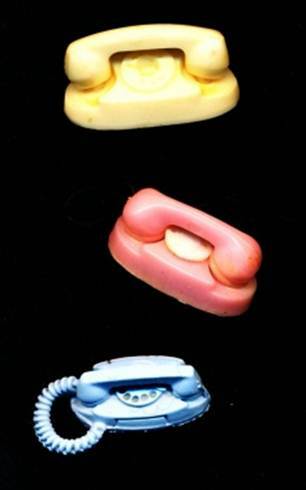 This suits the toy manufacturers who are now using coloured plastics (below). 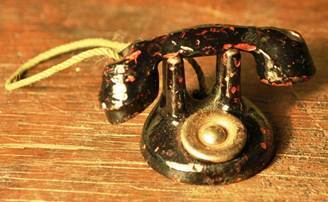 The receiver-transmitter, body and dial are often in contrasting colours. 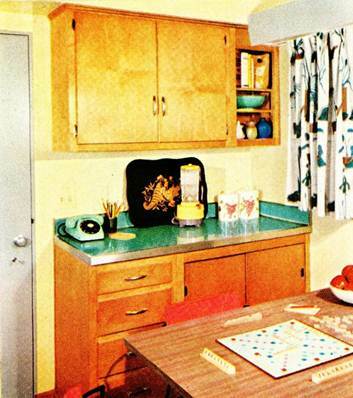 The dial wall phone becomes popular in 1956 in kitchens and basements. 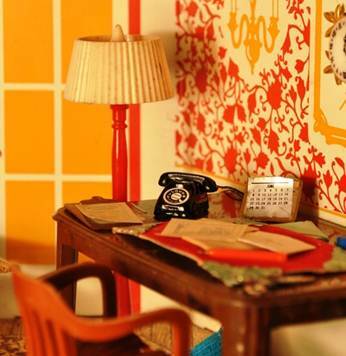 This dollhouse example (maker unknown) is painted metal. 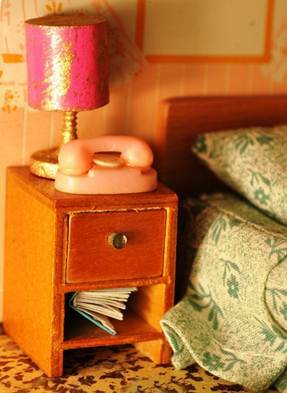 In 1959, the Princess Phone made its debut and was particularly touted as a bedroom phone, because the dial area lit up when you lifted the transmitter-receiver. 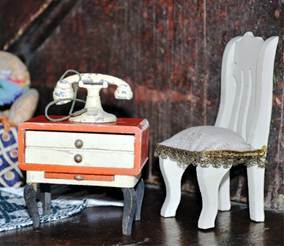 It was available in white, beige, pink, blue and torquoise. 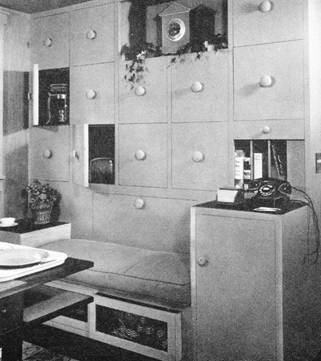 The compact arrangment was seen as a space saver. 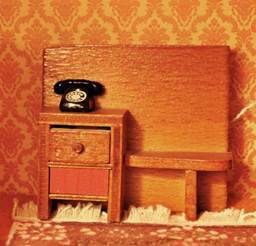 In the 1960s, there was an increasing trend to have more than one phone per house. 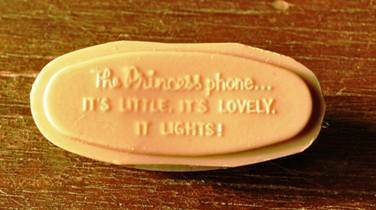 The Princess made the transition to push buttons in 1963 and was discontinued in 1994. 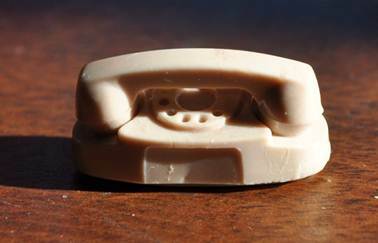 Above Giveway from 1959, beige plastic 1¼ inches long. The three below range from ¾ to 1 inch long. 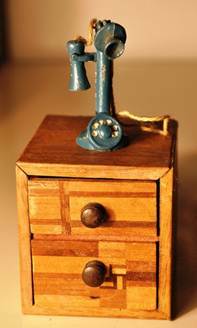 The blue metal one is more realistic with a spiral cord. 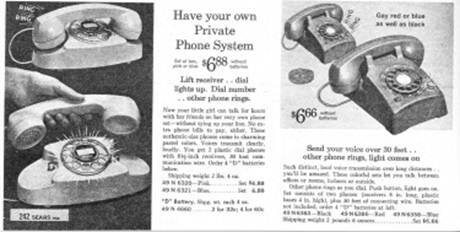 In this Sears ad of 1964 for children’s toy phones, the two most popular types – the Princess and desk phones – are shown. 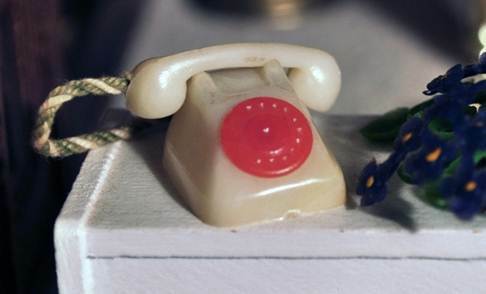 Push-button touch-tone phones made an appearance in 1964 but were slow to infiltrate dollhouses, even though they became widespread in real life from the 1970s to today. 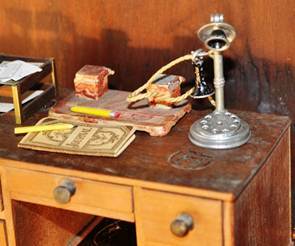 The earliest ones had only 10 buttons, soon augmented by another two. 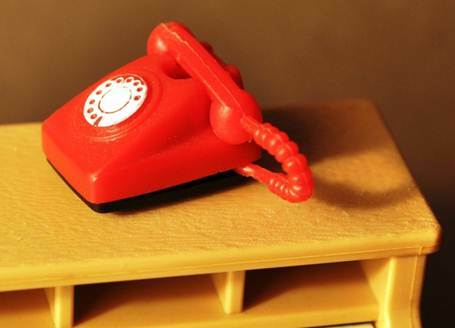 Lundby dollhouses still used dial phones: this yellow plastic example with a black dial is from the 1978 catalogue. 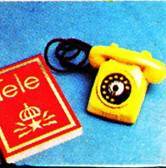 In the 1974 catalogue (below), a white one with a red dial and two-colour cord is shown. 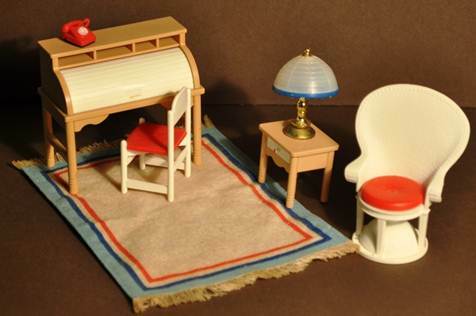 Tomy’s furnishings from the 1980s included a small red plastic phone with a white dial and black base marked “Japan”. 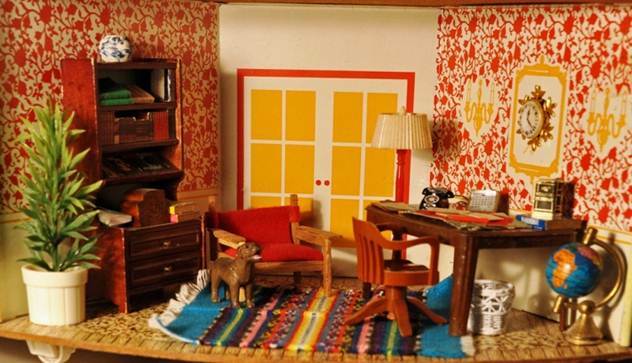 The base is only ½ inch long. Strangely, this survey from the 1880s to the 1980s is ending with a return to the early types, because they were reproduced in the 1970s by Shackman and distributed by Federal Smallwares of New York.